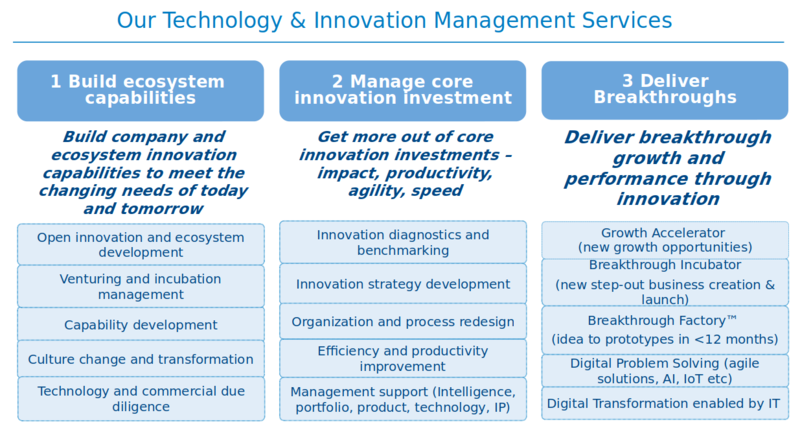 We offer a unique set of capabilities to help clients succeed in Technology and Innovation Management (TIM). Arthur D. Little’s TIM services address our clients’ most critical challenges in three main areas: building ecosystem capabilities; managing core innovation investment; and delivering breakthrough innovations. In 2013, Arthur D. Little completed its 8th Global Innovation Excellence Study (GIES), a global, cross-industry survey of trends and best practices in innovation management. Drawing on over 1,000 responses across the last two GIESs, it shed new quantitative light on the basic key question: what innovation management techniques achieve the best return on innovation investment? In 2015, Arthur D. Little followed up with a study to maintain our insight into emerging R&D management practices. Rather than seeking quantitative inputs from hundreds of participants, we prioritize a deep qualitative engagement with innovation leaders. As a first step, we identified a number of innovation-leading companies and invited them to contribute best-practice examples and to participate in a reflection on different R&D management practices. Through a series of interviews and internal reflection with leading practitioners in our Technology and Innovation Management practice, we then developed 23 case studies, with 15 companies identified as innovation leaders. The full results were analyzed and shared with the benchmarking participants. From the rich material that these companies shared with us, Arthur D. Little identified common challenges and insight into how these innovation leaders are responding. Based on this material, Arthur D. Little is developing a series of viewpoints over the coming months, each focused on specific aspects of the study. Anonymized case studies and quotes from our interviews and meetings have been used to illustrate best practice. If you face these challenges and would like to discuss our findings in more detail, please don’t hesitate to contact us. Building on our competitive insight in Overcoming hurdles: insights into stage gate management from more than a decade of innovation surveys, Arthur D. Little’s Global Innovation Excellence Benchmark is intended for business leaders and senior innovation executives with corporate or divisional responsibilities for innovation management (e.g., chief technology officers, chief innovation managers, heads of R&D). A report with analysis from the first wave of responses is available here. All participants receive, on request, a free personalized benchmark report designed to help them understand their innovation performances versus their peers, and to identify the most important innovation performance levers and best practices for their organizations. Please contact us if you would like to see sanitized example extracts from the individual company benchmark report you would receive. The many hundreds of companies that have already participated have found this report to be very valuable and insightful. All data is reported anonymously, and we maintain strict confidentiality with respect to company-specific survey data. Download the PDF version of the questionnaire (use Adobe Reader or equivalent for form functionality) and return it electronically to the benchmark team. Please contact the benchmark team to allow them to organize feedback from your responses. Where to start to improve your innovation investments? Innovation management covers many aspects, from business intelligence to idea generation to managing intellectual property and working with innovation partners. They are like links in a chain. One of the challenges for managers is to keep all of the links in this chain in good shape in order for the innovation management process to succeed. To focus on the whole chain in a more balanced way, it is recommended that companies utilize a diagnostic tool to assess the quality of the different links. At Arthur D. Little, we have developed a set of well-proven diagnostic tools that serve hundreds of companies. They go from doing a relatively simple “Innovation Management Health Check” to more advanced diagnostics that benchmark the quality of the different parts of your innovation management approach, or that map your innovation culture. If you are looking for a diagnostic that helps you to assess the quality of innovation management in your organization, we encourage you to partake in the initial Arthur D. Little Innovation Management Health Check below. We have identified characteristics that are associated with highly innovative companies and structured them in a way that highlights areas that may be of concern to your business. By checking the degree to which these characteristics are present in your company, you will get a fresh look at where you stand regarding innovation management and which “weak links” probably need attention. Innovation strategy and its operationalization through product, technology and R&D strategies enable companies to focus, balance and sustain innovation activities by clarifying the what, why and how of innovation. Many companies still don’t have well-articulated innovation strategies. Many others have innovation strategies that are too rigid and prescriptive for today’s agile world, in which rapid piloting, failing fast and capturing opportunities through start-ups and other innovation partners is increasingly important. Delivering new growth outside the core business is at the top of the CEO agenda for many companies in mature sectors. Our Breakthrough Incubator service is a unique and powerful approach for creating and delivering new step-out businesses. Using this approach Arthur D. Little acts as lead delivery partner in a fully externalized incubator process managing a network of other players, covering end-to-end innovation from ideation through to consumer insight, concept and product development, prototype manufacture, in-market testing, packaging development, brand development, operational and supply chain planning and launch. The Breakthrough FactoryTM is a unique offering in which we support our clients in developing and delivering technological breakthroughs within 9-12 months. The method is especially suitable for industries such as manufacturing, automotive, transport, chemicals, aerospace, defense and med-tech, in which science and technology are s a key differentiator.